I want to tell you about a breakthrough that can save your life, or the life of a loved one. In 1996, while on a gold mining expedition in South America, I discovered that chlorine dioxide quickly eradicates malaria. Since that time, it has proven to restore partial or full health to hundreds of thousands of people suffering from a wide range of disease, including cancer, diabetes, hepatitis A, B, C, Lyme disease, MRSA, multiple sclerosis, Parkinson’s, Alzheimer’s, HIV/AIDS, malaria, autism, infections of all kinds, arthritis, high cholesterol, acid reflux, kidney or liver diseases, aches and pains, allergies, urinary tract infections, digestive problems, high blood pressure, obesity, parasites, tumors and cysts, depression, sinus problems, eye disease, ear infections, dengue fever, skin problems, dental issues, problems with prostate (high PSA), erectile dysfunction and the list goes on. This is by far not a comprehensive list. 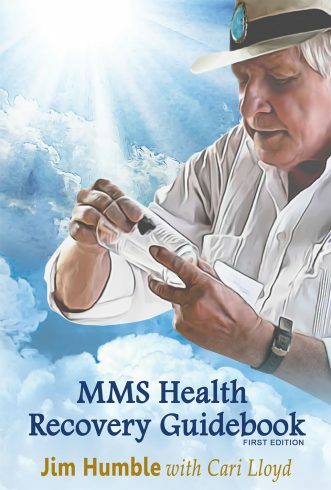 I know it sounds too good to be true, but according to feedback I have received over the last 20 years, I think it’s safe to say MMS has the potential to overcome most diseases known to mankind. It is important to note that MMS does not cure disease. MMS is an oxidizer, it kills pathogens and destroys poisons. When these are reduced or eliminated in the body, then the body can function properly and thereby heal. I often say, “The body heals the body”. MMS helps to line things up so the body can do just that. I have done many things in my lifetime—gone from a backwoods boy in Alabama, to the Marines, to a nutritional and alternative health enthusiast, to Aerospace, to electronics researcher, to inventor (of many things), to gold mining. Realizing I found “real gold” when I discovered MMS, from that point on I’ve dedicated all my time and effort to helping others recover their health and to bringing this technology to the world. It is my mission to bring this knowledge of health recovery to mankind. All profits from the sales of my books go towards this mission.